This is overdue, I apologize for the delay. May and June have been busy months for me and after each trip was another activity so it seems everything has collided. Below is my summary from an amazing hike while in the Pacific Northwest. Enjoy! The hike started off with a pretty inclined paved road. The scenery was gorgeous, and the day was clear and warm (around 70 F/20 C). I noticed pretty quickly that my breath was rapid early on. I evened out my pace and continued forward. We climbed, and climbed and climbed. In between the climbing were several water breaks. I started drinking water with the very first step, as I didn’t want to add any stress to my body by being dehydrated. We passed alpine marmots, eyeing us suspiciously. The views were some of the best I’ve seen, like ever. I never wanted to leave and it helped that it was so beautiful because the hike started to show signs of slowing me down. 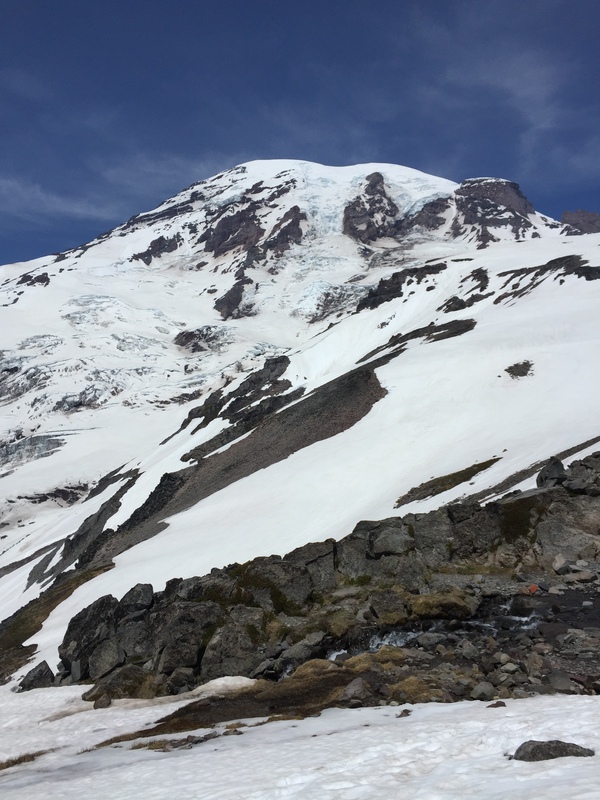 Even though we were nearing June we expected and trampled through tons of snow on this hike. Once we near the camp the climbing steepened on the snow fields and I quickly wished I owned waterproof pants or gaiters. We saw loads of people hiking with a snowboard or skis and some even passed us as the gracefully boarded down the mountain. It looked like such fun! 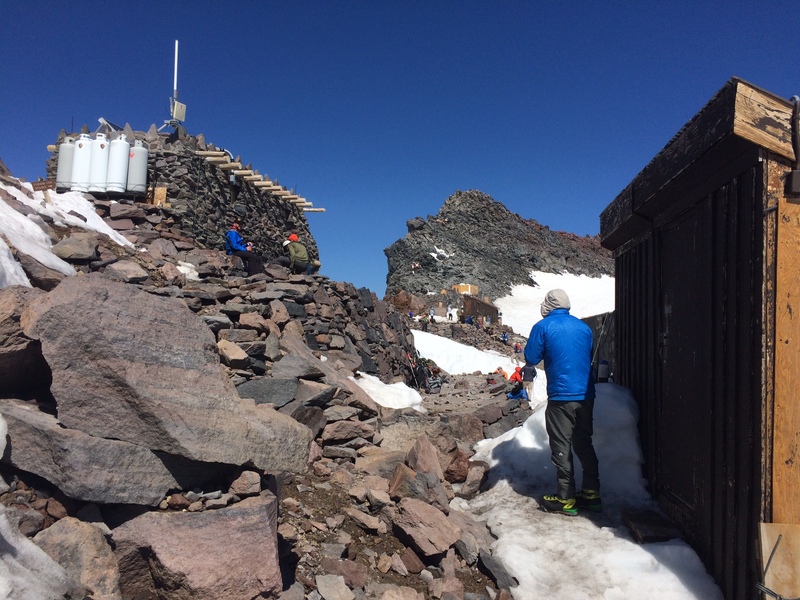 About thirty minutes from Camp Muir I started feeling pretty sick. My head was starting to hurt despite having a filling breakfast and energy bar only a few minutes earlier. I knew I was drinking enough water because I had to pee constantly. I told myself I could do this, and attempted in vain to hype myself as best I could. Before long I realized I just didn’t have it in me—even though quitting is something I just don’t do. I was devastated. As each step became harder I knew I had a decision to make. I made a plan to make it at least to a set of rocks not too far up a hill we were battling. My fiancé decided to push on and I would wait on the rocks. I watched him climb much faster as I fell into the background. I envied him at that moment. Why couldn’t I climb like that? I tried one last time to motivate myself and push forward faster, my body said hell no. After numerous breaks and some prayer I made it to the sanctuary of the rocks. Once seated comfortably it dawned on me that my feet were finally showing signs of defeat as well. They were wet and numb and my fingers achingly cold. Besides being exhausted I felt dizzy and as though I might vomit. Not a fun feeling but I was so thankful to be on solid ground—even rocky ground—I didn’t care too much about my physical state. I settled into the rocks and after drinking some water decided to have lunch. After my sandwich was devoured I started taking pictures and thinking of the rest of the hike. I stared at the top of the mountain which wasn’t that much higher than me. I felt accomplished rather than defeated. 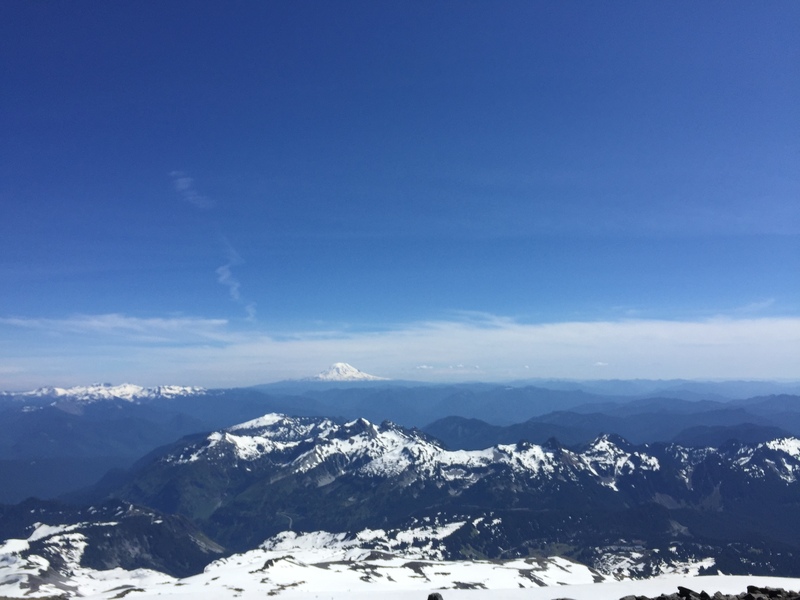 So what I didn’t make it to Camp Muir, I made it pretty close (I later found out from the fiancé ). Why couldn’t I be happy that I made it so far on my own? As I reflected on the art of being thankful for the little things, I was suddenly in a state of euphoria. It was divine. Fifteen minutes later I saw a figure that looked like my guy and was pretty excited. The break did me good and ultimately I’m glad I listened to my body and stopped when I did. We began our descent down to the hotel and slid (quite literally). I couldn’t believe how fast it was going down. I slid down one huge steep hill and it was so much fun. Then I slid down others not so intentionally but it was still fun. On the way down we saw quite a few alpine marmots and a black fox! The fox was most surprising as they’re usually pretty elusive. He or she was sleeping among the trees curled up, and I think we woke it. The sleepy amber eyes stared at me uninterested. If you happen to plan a trip to Mt. Rainier let me offer you some advice. Wear suitable clothing! There is a ton of snow and even if it’s not cold starting out unless you have waterproof shoes and gaiters your feet will be absolutely soaked. This wasn’t a deal breaker for us, but it could make the hike miserable for you. You don’t want that. Also, if I ever did this again, I’d bring a sled on my back—a small one. It’s much faster going down. Lastly, pack more energy bars, sandwiches, etc than you think you need. Because you’re climbing the entire way to the camp it’s absolutely exhausting—and calorie zapping! The way down is easier but still tiring. You will want something to replace the energy. This is such a long post so if you made it to the end kudos to you and thank you for reading! All in all I think it was a success. If you’re interested in our stay (Paradise Inn) just let me know and I’ll post about that–otherwise it’s not that interesting. Stay active my friends! I’m writing today’s post from the comfort of a friend’s car. Our convoy of cars, trucks, and SUV with bike racks are headed north to Pittsburgh. This weekend we are going to ride a portion of the Great Allegheny Passage, starting from Pittsburgh, PA and ending in Cumberland, MD. The total distance will be around 150 miles and unfortunately it isn’t all flat! But hey, let’s live a little. I started mountain biking around the same time I met my fiancé, in 2010. It’s a challenging yet rewarding activity I really love. Since moving to Maryland a few years back I haven’t been on a bike much, but that’s all changing since I purchased a new bike a few weeks ago. We took it out on some trails and had a blast. It is clear I will need some work before I feel completely comfortable and I’m also looking into taking a skills course to speed that process up. I need all the help I can get! If you’re interested in mountain biking only I have a blog dedicated to that. I’ll add that link below. Road biking (this particular ride will be road and trail) isn’t something I’m all that familiar with, but that’s not to say I don’t like it. When the opportunity presented itself and we were invited I signed up immediately. This weekend will be the farthest I’ve ever rode-should I finish! I’m both enthralled and nervous. What if I get sick? What if I’m just too weak? What if I hate it!? I can’t help thinking like this, I’m hard wired. Today we ride for about 6 1/2 hours to cover 65 miles. I really hope I make it and I also hope I’m not the last one. Wish me luck ya’ll, and maybe a prayer or two 😆. I’ll be posting pics as I can! Have a great weekend! 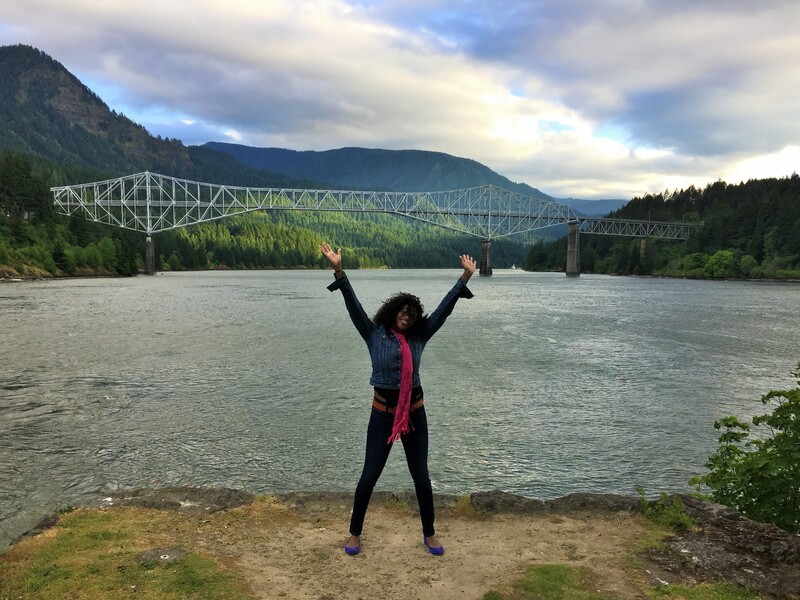 Soaking it all in at Cascade Locks. Lovely Brewery. . . The Pacific Northwest has always been a favorite of mine and I’ve often wondered if it’s because the sun only shines during the summer. I fantasize about living in a place where the sun isn’t my constant enemy and I’m not constantly worrying about what clothes I should wear, if my hat will cover enough, or if the sun beaming on my arm will cause a flare. Thoughts like this make me hate the sun, but then I realize there are worst things so shut-up and be grateful. Naturally, I’ve thought about living in sun challenged Seattle, Portland, or even Vancouver. When the opportunity to visit Portland presented itself, I almost leaped out of my chair. The people are warm, the city is gorgeous, and there’s so much to do!There are beautiful hikes only 30 minutes outside of the city. And the restaurants, oh my God, they were so good. I haven’t had decent Mexican food since leaving California–and I’m a bit obsessed with Mexican so you can imagine my suffering here in Baltimore. The carne asada tacos I tried every chance we had in were legit. Let me rewind and say that the food period was amazing. Portland is a foodie’s dream! I have a girlfriend who put together a list of places were seeing or eating at and every place she mentioned was absolute heaven. I’m going to pay it forward and share my gems (during my uber short visit) with you! Prost! – Cool German pub on Mississippi Ave. that has a cool vibe and really great beer. I will admit that I am not a beer drinker–but Portland is known for its beer so it was only right to try, which I did. Franziskaner Weissbier was crisp, refreshing, and dare I say…delicious! Por que no? – A taqueria with yummy margaritas. I devoured my tacos with much pleasure. Powell’s City of Books – Largest independent bookstore in the world. If you love books check this place out. Their rare book collection is impressive, and their self-publishing station is really cool! Mapplewood Coffee & Tea – A quaint coffee shop with a special area in the back for the little ones to play while you sip tasty lattes. Divine. 10 Barrel is perhaps my favorite because of their pizza. No words can describe the quiet party in my mouth. It. Was. Good. Go some of their food and you will not be disappointed. Promise. I can’t wait to go back and explore all Portland has to offer. I really enjoyed my sampling during the long weekend we were there. Until the next visit I will be dreaming of beer and coffee. #westcoastbestcoast.